The heir of the Yagami Clan and rival of Kusanagi Kyo, Iori wields pyrokinetic powers and is a berserker due to the Orochi demon blood running through his veins. His ancestors helped seal the Orochi Demon along with the Kusanagi and Yata clans. However, the Yagami clan betrayed the Kusanagis, and ended up being cursed the the Orochi. As a result, the Yagami clan have demonic powers that cause them to die at a young age. Quite impressive. I think this photo has been around the internet for a while. I remember seeing it several years ago, but never found it again until now. Great work! I know Shiranui Mai is supposed to be the sexiest female fighting character ever to be created during the 16-bit era… But frankly, I’m thankful to have found a cosplay of her that doesn’t make her look… well… slutty. Shiranui Mai, Ninjutsu and Koppo-Ken master, who, in her mind, thinks Andy Bogard is her fiance… Though Andy chooses to suppress his feelings for her and would most often treat her as his younger sister. Frankly, who can resist a girl like Mai? 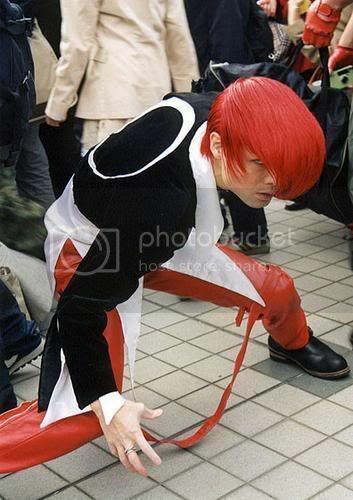 Pretty cosplay, isn’t this? Most people would probably argue that the cosplayer’s footwear is wrong and that Mai doesn’t wear dark stockings with this signature outfit… But hey… Isn’t she to die for? Photo originally from Dyson’s Fear in his article “On Cosplay“, which unfortunately has more hate on Western cosplay. My comments on this sensitive topic lie here. You are currently browsing the archives for the The King of Fighters category.